Costa da Morte is the name given to the long stretch of coast lying in the North-West of the Province of A Coruña which runs between A Laracha and Muros. This stretch of coast received its name both from the many ships wrecked upon its treacherous shores and as it contains the Cabo Finisterre which was believed to be the end of the world where everything sunk into the sea. It is an ominously beautiful stretch of coast but completely exposed to the swells and weather of the Atlantic Ocean and it is easy to see where the legends come from. 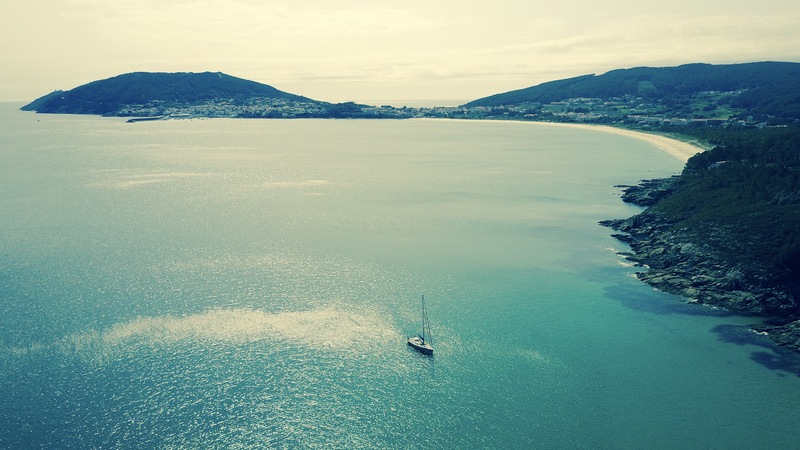 Finisterre was the first place that we anchored. Having readied the dinghy we motored into land and enjoyed a lovely but very hot hike up Monte Facho to the Cabo Fisterra lighthouse. This is a fantastic look-out point and it is also the final destination of the pilgrims on the Way of St. James (O camino de Santiago). Many pilgrims come to Cabo Fisterra to burn their shoes or boots on the cliff after having completed the pilgrimage to the shrine of St. James in Santiago de Compostela. Upon arrival in Finisterre we dropped anchor as the only non-Spanish boat in the harbour. By the end of the day there were 4 more Dutch boats. Seb made a quick dinghy tour along the boats and we ended up with a super gezellig borrel and barbeque on the beach with 16 people. Cruisers have a wonderful social flexibility and generally a willingness to share food, drinks, stories with little prompting. No pressure, everyone welcome. 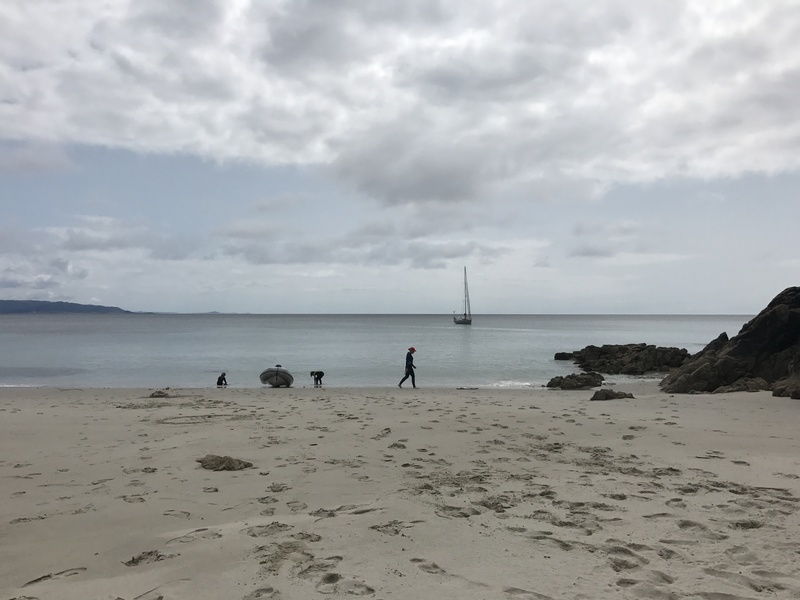 On our second day in Finisterre, Emma drove the Dutch (really, she did) and I SUPed (Stand Up Paddle) to a little bay about 2 nautical miles from Finisterre village. We dropped our achor and enjoyed a wonderful day of total freedom, just the four of us. Wetsuits (the water is still only 14 celcius, brrr), snorkels and fins on and splash, we all swam a significant distance to the beach. The monkies were amazingly game for the adventure and although Macsen struggles with what he calls ‘fish angst’ he swam the distance and back and spent the day clambering around our private beach, scaling the rocks and then plunging back into the fish infested waters to snoop about again. It is moments like these when I am so grateful that we have this time together and that the kids can enjoy this kind of freedom, can spend time truly enjoying just being kids. Seb swam back to the boat to collect beers, juice and snacks. Paradise already.